Touch is one of the most important senses that humans have. As well as letting us sense the world around us, it also provides vital information when we meet other people - the old adage that you can tell a lot about a person from their handshake has at least a grain of truth in it. Now researchers from Université Paris-Saclay are attempting to bestow the same benefits onto robots. Adriana Tapus and her colleagues are aiming to develop a humanoid robot that's sensitive to tactile stimulation in the same way people are. 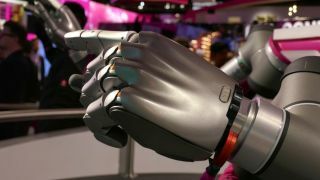 “Giving robots a personality is the only way our relationship with artificial intelligence will survive," said Tapus. "If we can simulate a human like emotional response from a robot we can ensure a two-way relationship, benefiting the most vulnerable and isolated members of our society." Alongside a team that included Moustapha Hafez, Mehdi Ammi and Pierre-Henri Orefice, Tapus has been investigating the social interaction strategies that could allow robots to integrate in different human environments. "Our research will help the next generation of social robots to be polite, empathetic, and maybe have their own sense of humour”, said Tapus.